﻿If you're going into grade 11 or 12 and want to spend more time at camp, the L.I.T. program is for you! ﻿What is LIT all about? LIT stands for Leader in Training, and in short, it’s all about helping young people understand and experience what it means to be a servant leader. During their month (and a bit) at camp “LITs,” as we like to call them, will learn about leadership, serving, camp life, taking care of children, and everything in between; from cleaning toilets to belaying and archery. The L.I.T program exists to train young people to be leaders who serve by putting the needs of others before their own and by placing their value not in the fact that they are in charge or in control, but in God and the fact that he has called them to lead others. It is our hope that the LIT program will train young people to be confident and joyful in their calling in Christ and feel equipped and ready to spread the Gospel from the change Christ brings in their hearts. What does it look like to be an LIT? LIT’s are generally at the camp for the entire time we are running camps. 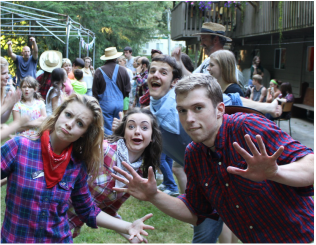 They are here for all of staff training, spend the week of Teen camp as campers and then during Huzzah, Sparks, and Family camps they spend time learning, helping out around the camp and of course in cabins co-leading with experienced leaders. How old does an LIT have to be? If you are going into grade 11 or 12, you can be an LIT! The LIT program costs only the price of teen camp. - First, fill out the online staff application form. Make sure you select Leader in Training as your position. - Second, you will be automatically registered in Teen Camp, and the balance will be added to your account. We will get in touch with you about details regarding what to bring, what to expect and how to prepare when we receive your teen camp application! email: lit@chariscamp.com for more info!